During any gala or fundraising banquet, live music playing quietly in the background adds classy ambience. 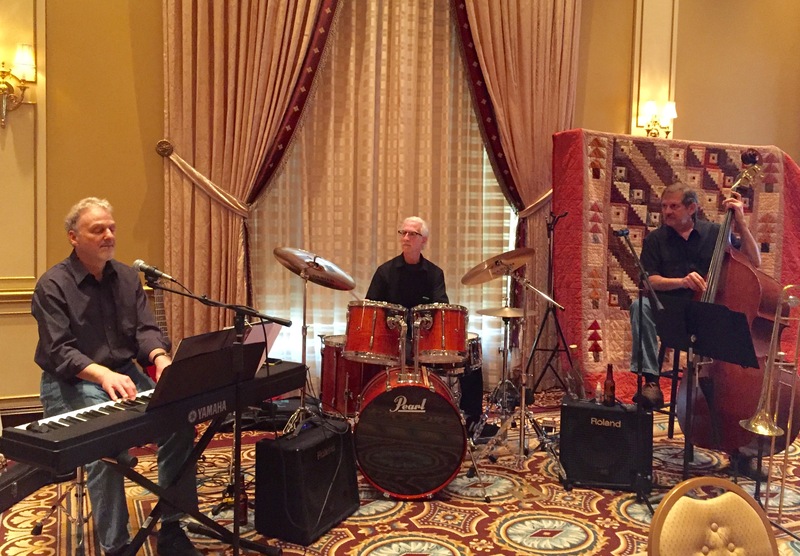 Jabberwock, a trio formed five years ago by Mike Hoover and Everett Thomas — Jim Miller later joined the trio — provides mostly jazz, some blues, and a little gospel at religious events. Mike Hoover plays keyboard, flute, classical guitar, electric bass, and some vocals. He currently plays in three other bands, including Drop the Dawg (Americana music) and New Song (a praise and worship group). He and some former high school friends are also working up some 1960s rock and roll for their high school reunion this summer. Miller and Hoover both work at Everence, a financial organization. Thomas works part-time for the Greencroft Communities Foundation. After playing with several other drummers, Hoover and Thomas are glad to have Miller as a regular. Thomas started out playing the upright bass. But recently he has played more trombone, classical guitar, and some keyboard. Because of the variety of instruments the men play, the musicality of the songs can be quite diverse. This includes several songs Hoover pre-recorded on his keyboard so he can play flute to the accompaniment. The group’s playlist, currently at two hours, includes some original pieces composed by Hoover and the first verse of the poem, Jabberwocky, which Thomas set to a blues pattern. The playlist also includes some hymns the group worked up for a vespers service at Greencroft last year. The plan is for another vespers service in September after Hoover is finished with his reunion band. In the meantime, nearly weekly rehearsals allow for learning new pieces and just plain fun making music.